Washing machine outer drums (or tubs) used to be made of metal, or even stainless steel. Almost all washing machine manufacturers have long since changed over to cheaper plastic. Now they can no longer rust, but there is a big disadvantage. Coins or other obstructions (which are extremely common obstructions inside washers) can now easily damage or destroy the tub. I’ve seen many cases of coins being punched right through during spin. They break off a big chunk of plastic causing a large hole, and a flood. There’s nothing much can be done for it then. However, if you just end up with a hairline crack you can sometimes repair a plastic outer drum. In the case of a hairline crack in a drum I’ve successfully repaired many of them with a soldering iron. You have to be careful not to put too much pressure on though. The point on a standard soldering iron is pretty small. You can potentially go through a drum with it like a knife through butter. Get the soldering iron nice and hot, then gently go over the crack to melt the surrounding plastic and seal it up. I try to bring some of the plastic from each side of the crack over to melt into the crack. It may be necessary to unplug the iron if you can’t get close enough. In which case you may need to keep plugging it back in to keep it hot enough as you go along. Be careful – although you could argue it’s kill or cure anyway. To do it properly the crack should be sealed from inside and out. I can understand most people wouldn’t want to strip one down though, which is far more involved. In fact many can’t be stripped down now anyway by design. If you have already stripped it down to investigate the leak before discovering the crack then that’s an opportunity to seal it on the inside too. Remember, if there is a crack in the outer drum it is likely to have been caused by a coin or other obstruction. Obstructions get inside the machine through things being left inside pockets. If you have a cracked drum you need to find the obstruction before even thinking of a repair. Check in the sump hose and pump filter. Also lean the machine over from side to side and front to back. If there is something inside the drum you can usually hear it slide about. 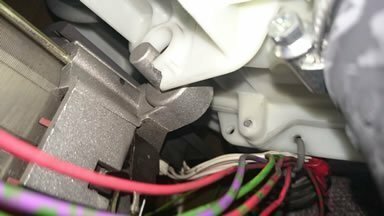 This article might help if there is something inside that you can’t get at – How to remove something stuck in washing machine. After sealing up a crack I’ve usually added a skin of sealant to really shore up the repair. Washing machine engineers use a special flexible and heat resistant sealant called Debor washing machine sealant. Rough up the surroundings with sandpaper and apply a large patch. A comment added below has asked about repairing an outer drum where one of the plastic motor brackets has broken. This has caused the motor coming loose and throwing off the drive belt. If you look at the photo he supplied it looks like a very difficult repair to carry out successfully. My first concern is how has this actually broken off? It’s not something that should really happen. Maybe there was a flaw in the mould somewhere? Anyway, the missing piece is still available. So the first option that springs to mind is to try and stick it back on. However, I’m not sure there is any adhesive available that is strong enough for the job. It would certainly need to be very strong because during spin the motor is constantly trying to move. Also there will be quite heavy forces at work during spin when the outer drum is bouncing around from side to side. As the motor is attached to the bottom of the outer drum you can imagine quite a lot of force will be trying to break the motor free. My understanding is that Richard is going to attempt to repair (see update below). If the plastic part that has broken away cannot be stuck back on, or cannot be found then it would be very difficult to try and put something else in place to do the job. It may be possible if someone could come up with an ingenious method. I have little confidence that it can be repaired though. The only other option is to replace the entire outer drum at great expense. Some older outer drums may come in two separate halves, but even so it is still a very big job. Regarding the repair attempt to the motor broken bracket mentioned above. Richard informed me that he found some extra strong epoxy resin supposedly as strong as metal. After sticking the broken plastic bracket back it unfortunately came off again after one successful wash. He concluded it wasn’t possible to repair it. It was worth a try, but as I suspected, the forces of the motor movement during spin are always likely to undermine a repair. If there is a hairline crack in the outer drum (tub) there is a good chance it can be repaired using my advice above. If a piece of the drum has been punched out though, a repair is much more difficult and risky. With a hairline crack you get a leak. With a chunk punched out you get a flood. So if you attempt to stick a piece of the drum back on and it fails – the washing machine will flood the kitchen. This could potentially happen a long time after the repair. You would need to make sure you’ve done a solid repair, and done more than just stick the part back in place. If I was attempting such a repair (I never did) I would want to stick the piece back in place with epoxy resin, then seal it over with something else, and then try to stick something like a large patch over it all. However, due to the risks of a flood if the piece ever came out I would never attempt such a repair for a customer. Hi John, yes, please send me a photo. Send me a message using my Contact form at top of the page and I will reply by email so you can reply and attach a photo. I’m trying to replace the inner drum dearing on a whirlpool 6th sense. The tub was sealed with a compound that was as hard as plastic! Can I get a compound to this standard at a wholesalers? Hello Will, it sounds like a sealed outer drum (tub), which is not repairable. They are welded by melting the plastic. Hi I discovered a similar problem with a damaged outer drum on a Bosch Maxx Classic WAE22260AU. The outer drum has circular damage (sort of crescent shaped), which ultimately wore through to leak in two areas, symmetrically bottom/right and top/left. The hole is now 5mm by 30mm in its largest spot. The two circular damages traces stretch over about 25% of the circumference of the outer drum, starting small and getting wider and deeper towards their ends where the holes are. One thing I also noted, the drum is not centered perfectly with the outer drum. However, when I rotate the inner drum, I cannot see any contact or chafing between the two, even when I push the plastic of the outer drum inwards with my thumbs. I checked for worn bearing (pushing and pulling the inner drum) but seems ok. I have the imression this developed over years of use. Along the traces I found dried-up washing powder, possibly mixed up with plastic filings. Anyone have a clue how this could have happened, or seen this before on a Bosch like this one? Hello William, you can always send me photos by using my contact form to get in touch and replying to my email back to you. The only thing I’ve ever known damage an outer tub is a coin or other metal object left in pockets. Sometimes the coin can punch right through and disappear. Usually there will be some indentation on the inner drum as evidence but if a coin was pushed through the outer tub by a part of the drum underneath one of the 3 lifter bars it may not leave any evidence visible from our side of the drum. hi there, and thank you for the tremendously useful site! i have a hotpoint washer dryer aquarius, which had a hole punched in the outer drum. my husband repaired it (at my suggestion :-) ) using fibreglass and epoxy resin. it has worked well in that the leak went from about a bucket of water on the floor to just a few tablespoons. my question is this: if we don’t mind this small amount of leakage, is it dangerous to keep running the machine, from the point of view of the electrics? if you were able to answer promptly that would be amazing as I ordered a new washing machine and now am feeling like i want to keep the old one, but i’d need to cancel the order today if i am going to! HI there, thanks for running this useful website. I have a front load stirling xqg65-908e about 4-5 yrs old, i just noticed a water leakage from the bottom of the unit. when i disassembled it, i noticed there are two symmetrical holes about 6 cm long and 5mm wide. i have read your previous post and i believed this could have happened by a coin trapped. I would really appreciate if i can send you some pictures and get some tips about the easiest to fix it ,for example if i can use sealant to fix the plastic outer tub. I would say you can’t repair large gashes or holes. The advice in my article is only about sealing cracks. The only thing I would attempt to use in such circumstances is something called Milliput, which is like two large sticks of different coloured plasticine (or putty). When mixed together they set rock hard and will even set under water. I used to use it all the time but large holes may be difficult. You’d need to rough up the surrounding area and make a patch much bigger than the holes. As long as it sticks properly to the drum and never comes loose it is a great product. Yes Steeve, it’s only really appropriate for relatively minor repairs. Hello David. I would say it is likely to be impossible to fix a drum where the bolts have sheared off. The concrete weight is very heavy and is shaken around very violently during spin so I can’t imagine any resin being strong enough to deal with that. The only cure is a complete new outer drum I’m afraid. The machine is scrap. What type of plastic is commonly used for the outer tub? I’m fairly sure it some sort of poly something. The exact type of plastic should be displayed on a logo/stamp on the actual tub itself. It could be anywhere on there but hopefully a determined person should be able to find it if they really need to know exactly. Maytag outer drums are PP30%GF which is polypropolene with 30% glass fiber fill for strength. My Maytag Maxima washer has the outer drum “glued” together rather than using the clips & gasket. Has anybody opened one of these and successfully put it back together either with silicone seal and screws or epoxy or an acrylate glue? Many outer drums are now factory sealed and cannot be taken apart and put back together. It’s a very bad step for repairability and longevity. I would think it highly risky to try and seal one yourself. If the seal failed you would have one hell of a flood. The seal would be subject to a lot of forces in spin. 1. Is it possible to repair that bracket (I can supply a photo if necessary)? 2. Should there be some sort of rubber (or similar) sleeve between the metal spigot and the plastic drum to absorb shock? There is no sign of one, but the spigot seems too big for the hole otherwise? Any help will be much appreciated! I don’t want to run the risk of any catastrophic failures (flooding!) as this is on a newly fitted wooden floor in a new kitchen! I don’t think it is likely to be able to do a decent lasting repair to the bracket if it has broken off. There should be some plastic sleeve or rubber sleeve but it has most probably fallen off somewhere. Check inside the base of the machine. It is very unusual for a plastic bracket for fixing the motor on to break. Just in case I’m not totally understanding exactly what has happened feel free to send me a picture. Thanks for the prompt response – I suspect you may be right about a decent lasting repair but I will send the photos. I did wonder if I could wire something back into place but it would be a bit of a bodge!. I may be missing something, but I cannot see how to attach a photo to my comments. Please advise me how to do that. BTW it is actually a WMT01, but I don’t suppose that changes anything! Hello Richard, just send me a message using my contact form and I’ll email you back and you can attach the photos to a reply. Update: I’ve received Richard’s photo and updated this article to cover the subject. I’ve also added the photo to the article above. Hello, I have a problem which sort of fits in with the above, with a bit of a big difference. I found this site as I was trying to work out how I could fix a hole in an outer plastic drum that I’m about to *create*! I have a Hoover Elite 920, circa 1985. It has an overflow hose that attaches to the outer plastic drum about half way up (i.e. half way up the drum) and then goes vertical and attaches to the overflow port in the rear panel of the machine, about 10 inches up from where it exits the drum. And there’s the first question … why the heck did they attach it to the drum way down there, instead of *above* the maximum fill line, where I’d expect an overflow hose to be placed? Anyway, that’s where it is. The overflow hose has cracked due to hardening of the rubber and the constant movement of the drum over thirty years’ of use. Water floods out of the machine at anything above minimum fill level at about the same rate at which it’s going in. I can’t get a new hose; specifically, I can’t get a new clip that attaches the hose to the inside surface of the outer plastic drum. I’m happy to live without overflow protection, so my plan is to remove the hose completely and seal the (approximately 2-inch diameter) hole it will leave behind. So I’m just wondering if anyone has ever done this and if so, what method did you use? I guess my thoughts are to cut a 2-inch diameter disc of plastic (although what plastic to use is the first question) and then glue / weld / somehow just attach … it to the outside of the drum. Many thanks for any suggestions or comments you might have. I don’t think that’s an overflow hose Jeremy – unless it attaches to a place where it could be safely pumped away down the drain. If it leads to open air, and therefore any water running up it would end up on the floor it must be an air vent..